Countryhouse Caravanserraglio begins where the road ends. It is situated on top of a hill, surrounded by the forest of the National Park of the Sibillini Mountains in the region Le Marche in Italy. The cities Assisi, Gubbio and Perugia are about one hour of distance by car with the new freeway. A visit to the holy city Loreto is absolutely to be recommended. For a sensation of the miracles of nature you can't miss to see Castalluccio di Norcia (a plateau with thousands of flowers in all the colours of the rainbow) and the stalactitic caves of Frassasi. Also by foot or by mountain bike you can reach places of fascinating beauty. We have some mountainbikes available. At the Autostrada Adriatica A14 direction Bari/Pescara take the exit Civitanova Marche. 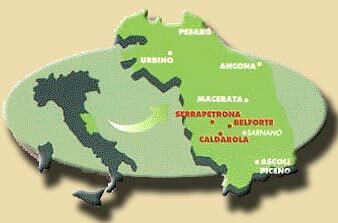 Then take the Superstrada direction Macerata-Foligno; exit Tolentino Ovest. At the exit turn right, after ca. 100 metres another right, following the indication Serrapetrona. 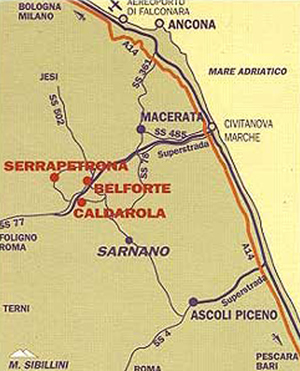 Before reaching the village of Serrapetrona (after about ten minutes) there's a crossing of three roads. About 20 metres before the crossing , to the left, there's a small road with a sign-board of Caravanserraglio. Please note that all the road outside the village are named Via Colli. Coming from Rome on the grande raccordo annulare (GRA) of Rome take exit Firenze. Roma-Firenze A1 take exit Orte. After having payed the toll turn right direction Spoleto, SS 675 direction Terni. After that direction Foligno-Macerata (Strada Statale 77 of Colfiorito-direction Macerata). At the SS77 take exit Tolentino Ovest. There's a direct train connection Milan-Civitanova Marche. From Civitanova Marche you can take the train to Tolentino. From Rome you have to change train in Fabriano and then to Tolentino. Call us when you have arrived at the station of Tolentino, we will come to pick you up. Look for the timetable at the website: www.trenitalia.it. Ryanair flies to Ancona Falconara Airport (1 hour drive from the Caravanserraglio agriturismo). Ancona Airport has national and international flights from Rome, Milan, München, Paris etc. You can rent a car and pick it up at the Ancona-Airport. There're cheap flights also on Bologna, Rome and Milan. The airport of Rome is about three hours driving from the Caravanserraglio Agriturismo. You can also fly on Bologna, about 2-3 hours driving from the Caravanserraglio agriturismo.